Dell XPS M1330, are you joking? Guys, are you joking? Three months to ship a notebook that I have already paid? When you order a system, the estimated ship date factors in our best currently available information, including the number of orders in front of you and the availability of parts. It should not change unless something impacts one of these factors. If that happens, we will contact you. 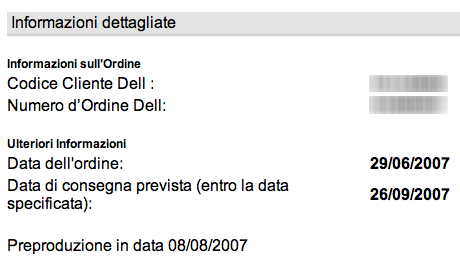 Unfortunately no mails and no phone calls from Dell to explain what’s going on with my notebook: maybe Italian customers are not so important for Dell. I’m really trying to find a good reason not to delete my order and ask my money back. This entry was posted in Dell, Technology by flod. Bookmark the permalink. I ordered my XPS M1330 around the same time you did and I just received mine yesterday. Good Luck! Pingback: Yet Another Tech Blog » Does Dell read blogs? Dell has millions of people ordering, so some people have to wait longer than others, just saying but i would get a refund and order a inspiron when windows 7 comes out wall street journal says its the best computer system in the world.